It’s difficult to imagine a world without trash, but Sweden seems to be heading in the right direction with less than one per cent of its trash actually reaching landfills. When compared to the United States’ 34.5 per cent recycling rate, it’s pretty impressive. Sweden achieves its high level of recycling through a series of rules and regulations on how citizens are expected to handle their trash. Instead of simply throwing everything in the trash and forgetting about it, the Swedes put a conscious effort into understanding where their trash should go in order to make the best use of every single waste product. Sweden divides its waste into eight different categories: newspapers, plastic, metal, glass, electric appliances, light bulbs, batteries, and food. Each category has a specific purpose for reuse. Bottles are melted down and rebuilt into new products, food is composted and used for fertile soil, glass can be manufactured into new containers, and so on. As for the 50 per cent of waste that can’t be repurposed, Sweden has developed a new process that consists of burning the trash to produce energy. These waste-to-energy plants successfully heat roughly 810,000 homes and provide electricity for 250,000 homes in Sweden. The remaining ashes from the waste make up about 15 per cent of the weight that was burned. The ashes are, of course, recycled and used for constructing roads. There may be some raised concerns about the harmful effects of burning the waste, but fret not because 99.9 per cent of the smoke created from burning the waste is non-toxic carbon dioxide and water, which is still run through filters to ensure clean air. Even the dirt from the filters is recycled to refill abandoned mines. Not only is it safe, but also the recycling system is so effective that Sweden actually accepts 700,000 tons of waste from other countries. The remaining less than one per cent of the trash left over is then placed in landfills. Although Sweden’s recycling process is one to be revered by most of the world, the Swedes still aren’t quite done cutting down on their trash. Perfection is the ultimate goal and Hans Wrådhe, who heads the section for waste and chemicals at the Swedish Environmental Protection Agency, has some policies ready to be put in place to further increase Sweden’s recycling. The Swedish Environmental Protection Agency proposed the idea to raise the cost of waste collection so people are more conscious of what they throw away. Wrådhe has also begun working with companies to produce goods that will last longer and to use materials that will be easily recycled. 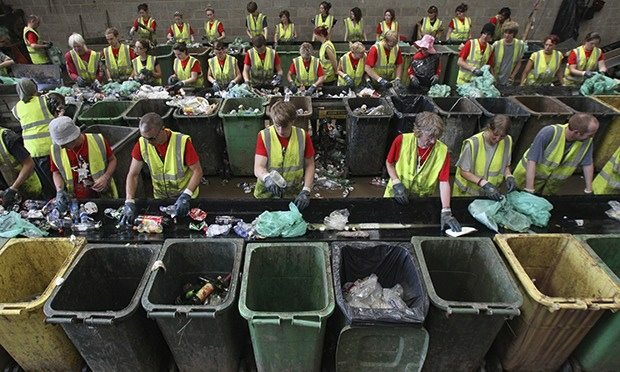 Although recycling may be a foreign concept to many in the western world, Sweden has proven itself to be a leader in treating our only viable planet with the respect that it deserves.